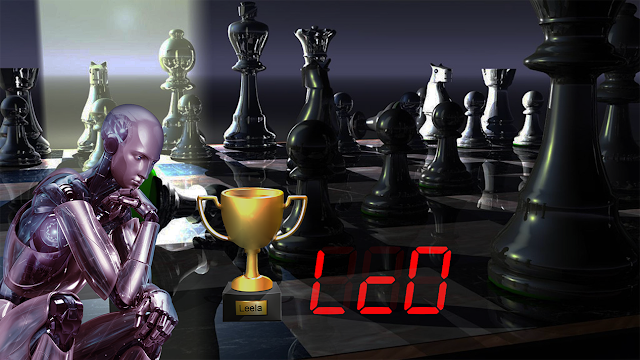 LCZero blog: Leela won the TCEC CUP! TCEC CUP-2 was a tournament running with the 32 top engines of TCEC running on normal TCEC hardware of 43 cores of 2 x Intel Xeon E5 2699 v4 at 2.8 GHz. Leela was running on a Nvidia RTX 2080 Ti plus a RTX 2080 with the 32742 net and Lc0 v20.1. The tournament had time control of 30'+5" (30 minutes base time plus 5 seconds per move) and predefined openings were used for the games(4 ply openings for Round of 32 and 12 ply openings for the rest of tournament). TCEC CUP is a single elimination format where each engine plays another engine a set of 8 games and the best of 8, the one with more points after 8 games, wins and promotes to next round. Format is such that the best of previous TCEC season(that of premier division) plays the weakest engine(the weakest of 4th division), the 2nd best of premier division plays the 2nd worst of division 4, etc. There is round of 32, round of 16, quarter finals, semi finals and the final. Leela started against Tucano, a relatively weak engine and faced no problem to beat Tucano in all 8 games with a 8-0 score. In this round only Stockfish and Ethereal managed to win with a perfect score like Leela, beating respectively Rodent III and Schooner 8-0. Leela would meet a new and rapidly developing engine that had some huge rapid increase in strength lately, Xiphos. And even though they started with 3 draws, Leela had no problem to win as she won 4 out of the next 5 games and promoted with 6-2 score. The strongest engines also promoted in this round so quarter finals would have the exact 8 engines of Premier Division. Leela here was matched with Andscacs and she started with a win, while in the 2nd game she outplayed Andscacs and she had a win, but Leela didn't manage to find the winning move so game ended in a draw. Yet she didn't really face any problems at all in the next games and she promoted comfortably with another 2 wins and all other draws promoting with a 5.5-2.5 score. In the meantime Stockfish promoted against Komodo MCTS winning easily 6-2, Houdini struggled against Fire having 8 draws in the first 8 games but a win in the 2nd game of the tiebreak pair of games, gave Houdini the promotion with 5.5-4.5 and Komodo also promoted but really struggled against Ethereal having 7 draws and 1 win promoting with a 4.5-3.5 also. In the game Ethereal lost, Ethereal could save itself with a nice defensive move that it didn't manage to find so it was eliminated. Here in Komodo-Ethereal game, with black to play, black can save himself by playing Bxa3! that leads to a draw. Yet, Ethereal had played Qc7? that loses. Here Leela faced the mighty Komodo and in most games she seemed always in control and it was she that would push for a win in some games, but didn't manage to get any single win at all after the 8 games. So they went into tiebreaks. That means pairs of 2 games would be played until one has better score in each 2-game pair. Yet, 4 such pairs have been played but all 8 games were draws again. So 16 out of 16 games were draws. But the next pair of tiebreaks would not have the normal 12 ply predefined openings but a different kind of book, the predefined openings from previous TCEC Superfinals. The line that was chosen(always randomly) was an interesting Pirc line with a dynamic position. Leela playing with black first, outplayed Komodo to obtain her first win of the series. So if she would hold in the next game, even with a draw, she would promote to the final. Yet Leela having white this time, easily outplayed Komodo and she managed to win again. So she promoted with a final score 10-8. In the other pair of Stockfish-Houdini a great battle was expected but most people expected Stockfish to prevail easily or not. Houdini after all is from September-October of 2017, a 1.5 year old engine while Stockfish is being updated almost every day really expanding its lead as the strongest Chess engine, while Houdini stays still. But these were just 8 games so everything could happen. And it had happened! First 8 games were draws. But then, in tiebreaks, Stockfish really lost a chance to win and promote as in a great game it outplayed Houdini and reached a winning position and while Stockfish showed an evaluation of +5.99(which is most times an instant win when Stockfish says that) it didn't manage to win! Next game was draw so with score at 5-5 a new pair of 2 tiebreaks games would occur. Next 2 games started with another draw but then in a Houdini-Stockfish game and while it seemed a draw fortress, Houdini found a nice attacking resource (called Alekhine's gun, that Stockfish saw it 10 moves before Houdini but couldn't do anything to prevent its fate) and executed it perfectly so it won easily after that. Stockfish was eliminated! It was a big SHOCK! Even though at these low number of played games like here 8 anything can happen, still Stockfish didn't lose a single game at premier division so when it loses in this TCEC hardware of 43 cores, is big news. In the Stockfish-Houdini, Stockfish had the chance to win the match and promote in this winning position where Stockfish showed a +5.99 score but didn't manage to win. Leela again seemed in control of the game and defended without any problems when she was with black and with white created some problems for Houdini but without anything much more than just applying some pressure where Houdini managed to draw eventually. So after first 7 games were draws, last game(8) before tiebreaks, was a very sharp and double edged opening Leela decided to get into, where she played some nice speculative attacking moves trying to apply pressure to the weak Kingside so Houdini had to be very careful, even though Houdini had a very strong counterplay with 2 advanced passed Pawns on the Queenside so Leela should had that in mind too. But Houdini played 2 suboptimal moves that can maybe even characterized as mistakes or blunders, but not that obvious mistakes though and more analysis is needed as position is crazy complicated, and Leela grasped the chance to attack! The attack went great and Leela played some nice attacking Chess and she played move 31 playing fxe5 with a +3.16 score while Houdini was at +0.47 and Stockfish dev 176 threads (that was kibitzing the game) didn't see fxe5 and was preferring 31.Rf1 with +1.11. After Leela played 31.fxe5 and after 2 more moves having been played the 176 thread Stockfish jumped to +3.03 seeing indeed that Leela's move was sound and superb. 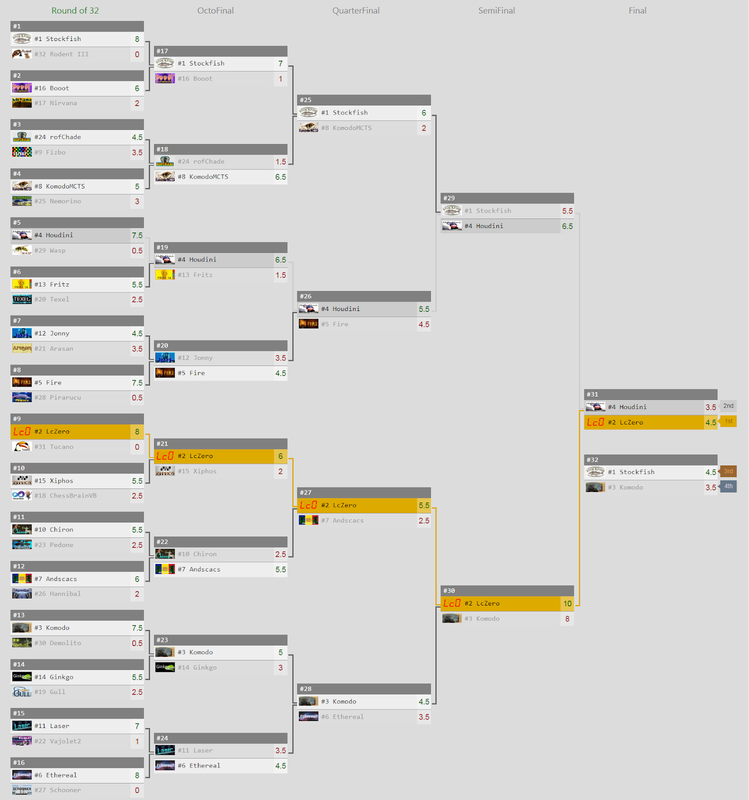 After that it was more or less over so Leela went on to win and win the final and the CUP! Archive of TCEC CUP2 is HERE! Leela now plays the Superfinal of TCEC Season 14 against Stockfish dev. Time control is 120'+15". Leela there uses Lc0v20.2 version and 32930 net while Stockfish the 190203(3 February 2019) version. First game was draw while in 2nd Stockfish seems to have an edge. 100 games will be played and the winner will be the TCEC Season 14 Champion! Games can be followed HERE! There is a mistake in this article, houdini win fire with the score of 5.5-4.5, not 4.5-3.5(quarter finals section). Is there any plan to deploy LC0 on BOINC? I believe this can make the contribution much more easier and attract many more people to the project.